Fun in the tub is a quintessential right of childhood. 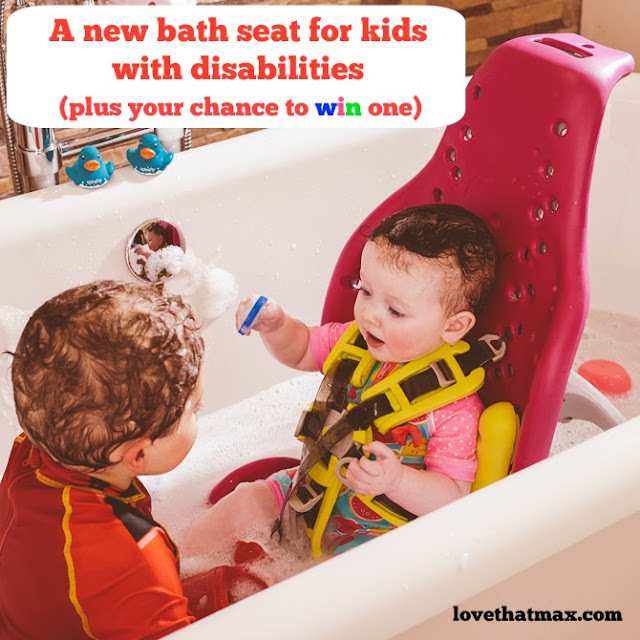 Enter the Splashy portable bath seat for kids with disabilities who require head and trunk support. It's designed for children one to eight years old, maximum 66 pounds. Besides the bath and shower, the tub's been tested and approved for use with water-play activities, in the garden and at the beach. At 9 pounds, it's super-portable. The Splashy is from Firefly by Leckey, the same company behind the genius Upsee mobility device and Scooot and the sponsors of this post. Product designer David Turner has a daughter with special needs who loves baths but had a seat that was bulky, uncomfortable and didn't recline; David had to support her with his arm. So he set out to create a seat for Vida and children like her. The Splashy is made from EVA foam, a soft material similar to what's used in Crocs, and retails for $399. It has a seat base, a backrest and a base and comes with 4 bumper supports, 2 lateral and 2 shoulder straps, and a groin strap to create a five-point harness or a three-point one. There are 26 recline positions, from upright to full recline. The seat back is 24 inches high x 15 inches wide, and the seat base is 12 inches deep x 14 inches wide. 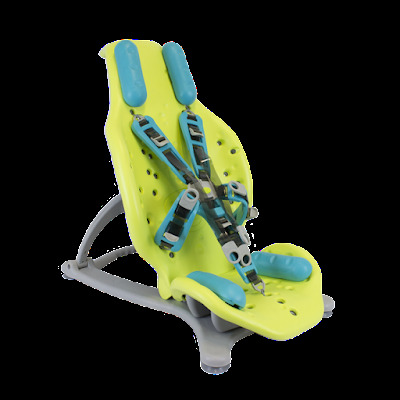 Colors include blue, green and pink, and you can pick any seat and harness/bumper color combination you'd like. It folds flat for storage, and there's a hook to hang it up. It's not yet covered by insurance, but the Firefly people are working on that. Also! It comes with a rubber duck. 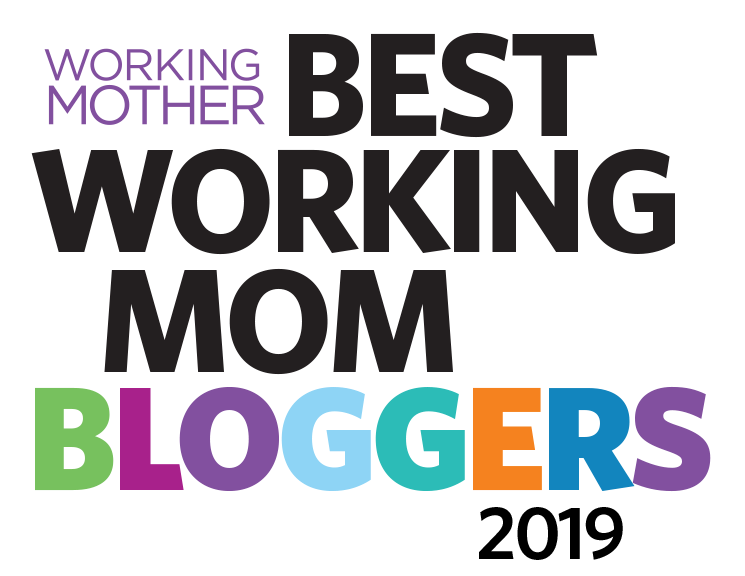 Enter below to win a Splashy (worth $399). This giveaway ends on Thursday, April 13 at 12:00 a.m. and is open to residents of the United States only, and the District of Columbia (excluding Puerto Rico and all other U.S. territories). The winner will be selected by random drawing within 48 hours after the contest ends and notified by email. 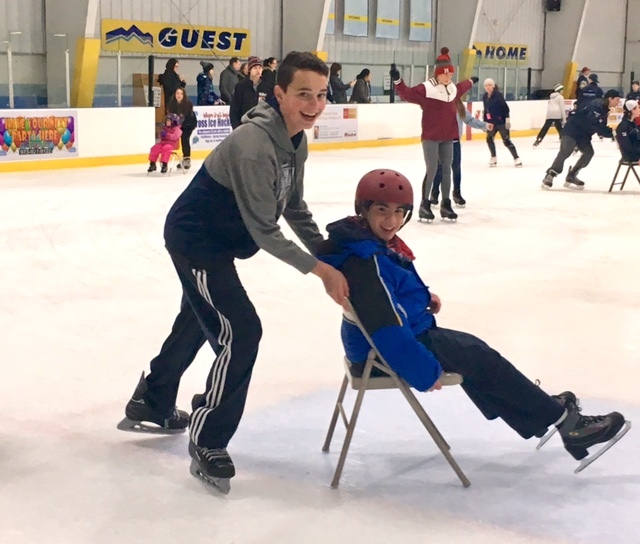 You must leave a comment below to enter (feel free to note how the Splashy could benefit your child) then click on the entry form to provide your email, privately. You can score bonus entries, too—see details and the full rules on the Rafflecopter entry form. Good luck! This is a compensated post, opinions are my own. As with any use of a device for your child, consult a professional therapist or medical professional if you have questions. For questions about the product, contact customer.enquiries@fireflyfriends.com or submit the form here. 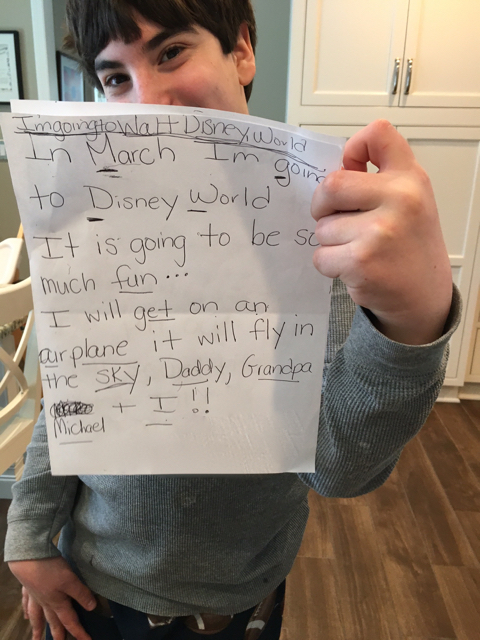 For months now, Max has been planning and anticipating a boys' trip to Disney World with Dave and Dave's dad, Grandpa Michael. 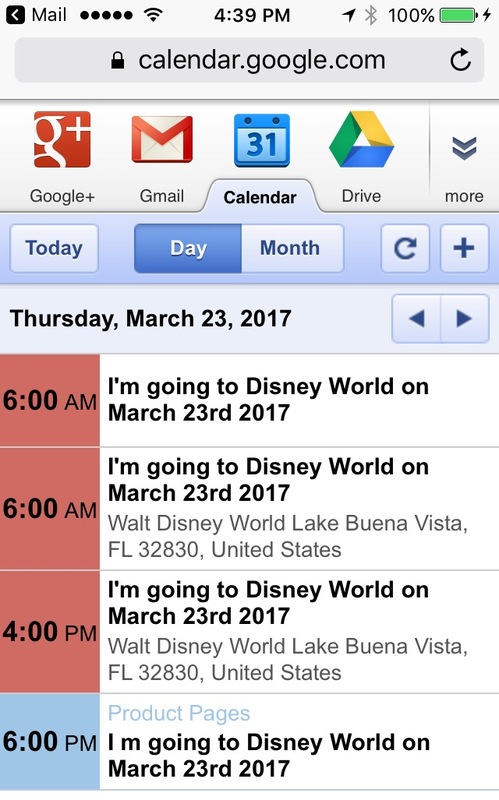 I figured they'd have the time of their lives. 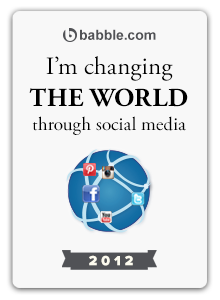 I never imagined the major milestone that lay ahead. Max stood on our front porch and squealed when the Uber showed up, and Dave and I had a flashback to a Disney trip years ago when Max was little and not yet able to maneuver stairs and the taxi showed up to take us to the airport and before we knew it Max had miraculously bolted down the stairs to it. Dave texted me updates throughout the trip. 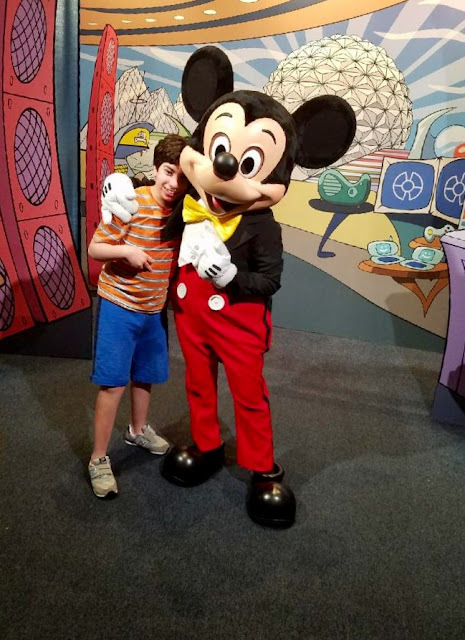 Max got to see his favorite characters: Mickey, Minnie, Donald Duck, Goofy and The Incredibles, with a bonus Buzz Lightyear thrown in. We knew that would be a highlight for him. He still believes. Dave and Max registered at Guest Services for the Disability Access Service (DAS) Card, where a staffer took both Max and Dave's photos and gave them a plastic card (you can also use a wristband). At rides, they could head to the FastPass stand for a staffer to scan the card and give them a time to return based on the current wait. (The DAS pass can also be used with FastPass+). The challenge for us is that Max has always been finicky about rides; he gets scared and backs out at the last minute. So having to wait around for rides based on return times doesn't work well. When Dave let staffers know that, they admitted them right away. The DAS Fact Sheet notes that Disney works with guests with disabilities based on their unique needs, and that's always been true for us. The one ride we knew would be a sure thing: the Tomorrowland Speedway, which Max has always loved. In recent years, has taken to pretend-driving our minivan in our driveway, a favorite activity. But when I've asked him if he wants to drive a car when he grows up, he always says no. Once, when I asked if it was because he has cerebral palsy and he said yes, I pointed out that some people with cerebral palsy drive cars and I've showed him YouTube videos. Still, he has remained dubious. So, Dave and Max headed to Speedway. And Dave texted me a photo—of Max driving alone. I called and confirmed, wondrously, "He is on the ride by himself?!" Yes, he was. He didn't want Dave with him. 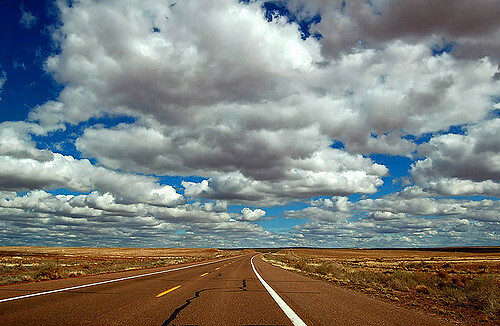 Max was pressing the gas pedal and maneuvering the car all on his own along that 0.4 mile-long racetrack. It was like someone had sprinkled pixie dust on me. When you have spent most of your child's life helping him along, seeing him willingly and successfully gain independence is magical. Part of this had to do with Max's maturity, both emotionally and physically. 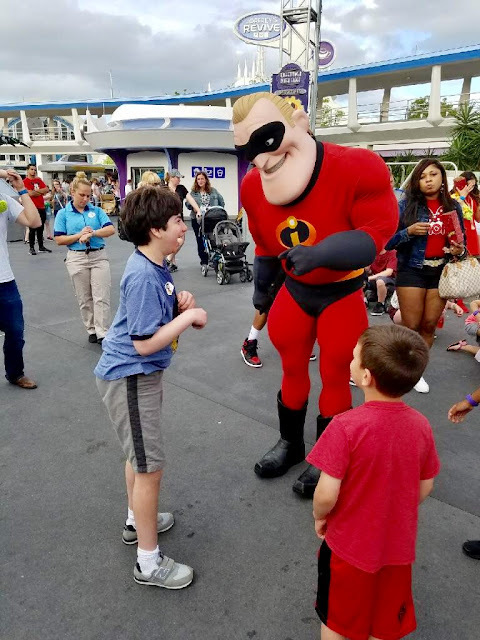 I've heard other parents of children with special needs speak of firsts at Disney World that go beyond getting on rides, everything from new words to new steps. 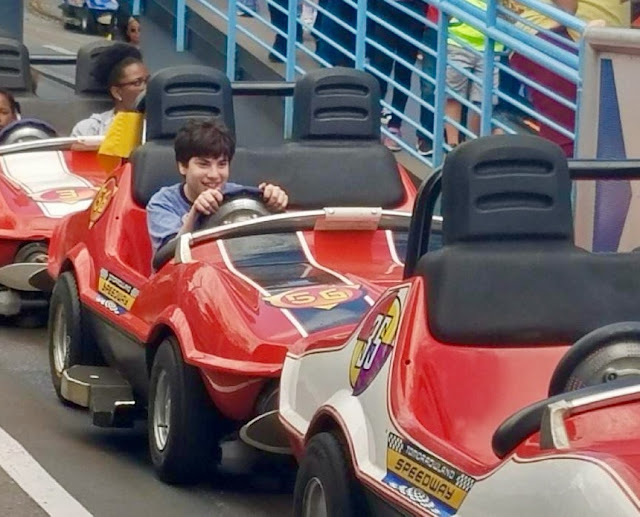 Part of Max's willingness to drive that car alone, I'm sure, had to do with the fact that he was in his happy place and had the confidence. Max wasn't just believing in Mickey and Minnie; he was believing in himself. 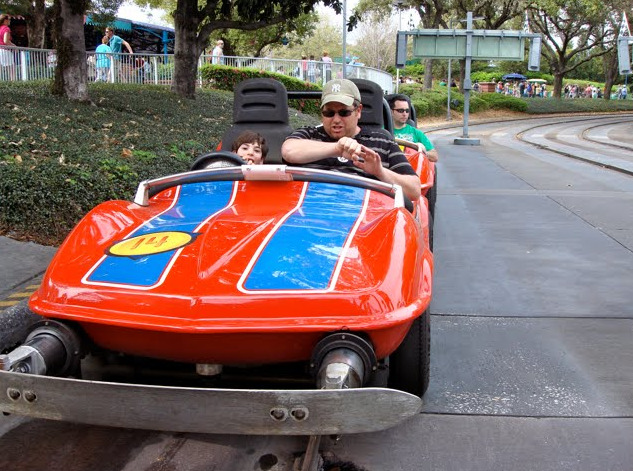 It became very clear to Dave on the trip that Max was breaking out, because for the first time in his life he went on a roller coaster, the Primeval Whirl in Animal Kingdom's DinoLand. Then he went on it again. Max ended up going on that Speedway ride eight times. Who knows, he may come home and ask for the car keys. The following was written in honor of Cerebral Palsy Awareness Month but, really, it's for any parent, anytime, anywhere. So, your child has been diagnosed with cerebral palsy. I know how scared, overwhelmed and devastated you may feel, because years ago, I was you. Perhaps you've never known anyone with cerebral palsy, and can only conjure up terrible images in your head. Maybe you think this is a tragedy and cry a lot. How could this happen to your child? You? Your family? 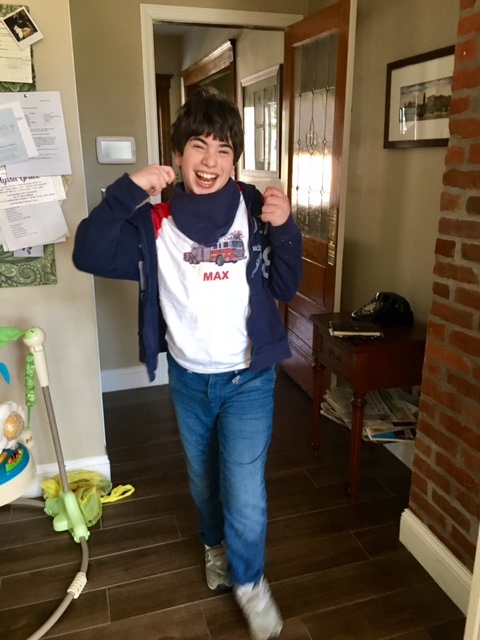 I think it was our pediatric neurologist who first verified that our boy Max had cerebral palsy, the spastic, four-quad kind that affects all of his limbs. The fact that I don't remember how or when the CP was officially diagnosed should tell you something that took me years to accept: a label is just that. The only thing—and I mean the only thing—that matters is the child in front of you. "Look at what he's doing, not his medical records," the neurologist has always told us. Of course you want to know: Will he walk? Will he talk? Will he be able to eat and drink on his own? Will he learn OK? What will he be like? But for the sake of your sanity, try to stop wondering about the future and focus on the here and now. If for nobody else, do this for your child, who needs and deserves all of your heart, soul and hope. Relish the bits of progress, the inchstones, rather than always aching for the biggies. It will be good for both of you. A child who can sit propped up with a bolster or who can bear weight on his hands and knees for a couple of seconds is a child who was not able to do that yesterday. A child who grasps a peg is a child who is figuring out how to use his hands. A child who nods to a toy he'd like to play with is a child learning to communicate. Every bit of progress is progress. Every bit is worth relishing. "Look at what your child is doing" also means appreciating the deliciousness. That can fall to the wayside as eagle-eyed you searches constantly for worrisome signs—or limb movements that may indicate the CP is not so "bad." Again, I get it. I was that mom. In always looking for what could be wrong, I neglected to fully appreciate what was right—my adorable child. "They're only little once," the saying goes. As much as you wish for your child to get bigger and do stuff, you will regret it someday if you don't savor the cuteness, which is not the least bit impaired. Don't torture yourself by comparing your child to his peers or obsessively reading and re-reading the list of milestones for his age (been there, done that). Do look to older kids, teens and adults who have cerebral palsy, to see how they are thriving; I've met many in the online community. Don't make the mistake of trekking from specialist to specialist, desperately searching for answers that don't exist. 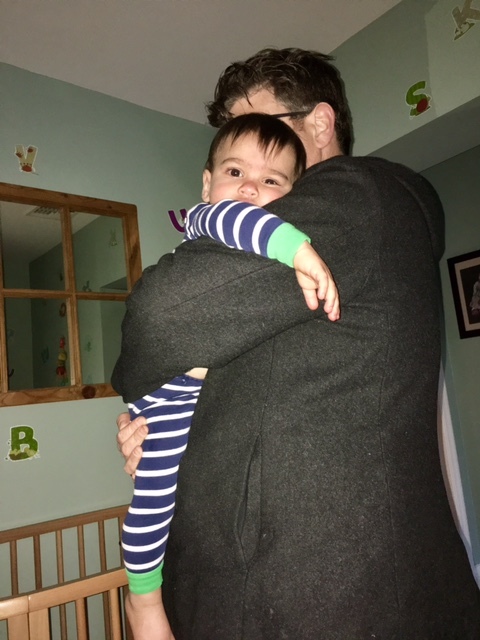 It's emotionally and physically draining, and you risk encountering gloomy doctors who depress you (like the neonatalogist related to a friend who agreed to see us, and who informed me that Max's future looked "ominous"). Ask around, find docs who are knowledgeable and who give you hope, then trust in them. 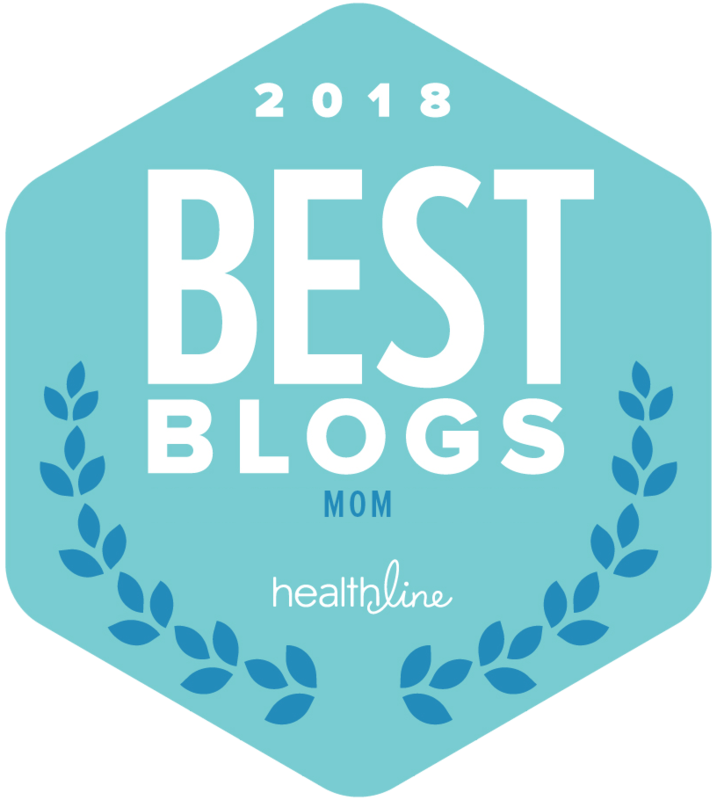 As for the anxiety in the pit of your stomach, take comfort in knowing that you are getting your child therapies, sitting on the floor and exercising his arms and legs, requesting yet more therapies, asking questions, reading up and learning. Children proceed on their own timeline. You are doing as much as you can. It may be hard to believe now, but no matter how your child turns out, he will be OK and so will you. Actually, more than OK. When Max was little and I didn't know anything about disability, I thought that not being able to talk in a typical way was an awful fate. And now? 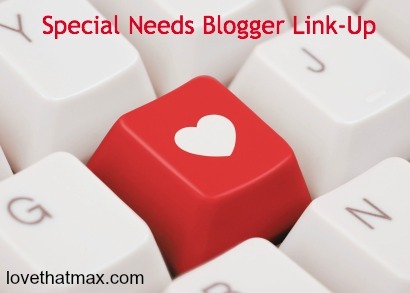 Max has a range of communication: some words, a speech app, gestures, expressions. We have conversations I never could have imagined, or dared to dream, way back when. We have inside jokes. We tease each other. We talk, in our own way. Max has his challenges—what human doesn't? His may be more obvious than others' but when I look at him I see ability, not disability. 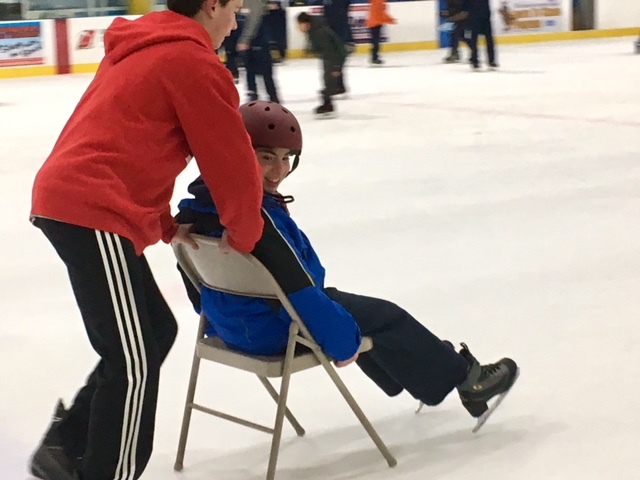 The cerebral palsy is just one part of who he is. Someday, you too will look at your child and see only him, a child as perfect in your eyes as any. The storied rainbow bagels of Brooklyn, New York, have inspired many a pilgrimage to the borough. In honor of Cerebral Palsy Awareness Month, the Cerebral Palsy Foundation challenged comedian Zach Anner to make the trek via train. Behold, the now-viral video. Because he's Zach, the video's amusing (that moment with the "Statue of Liberty"!!!) but at heart, it's sobering. 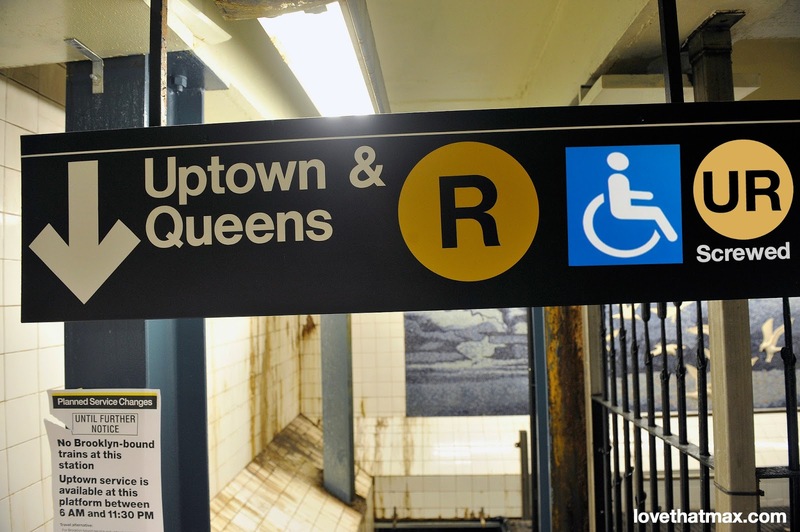 It doesn't seem like much progress has been made in subway accessibility since the 2013 short documentary The Long Wait by filmmaker Jason DaSilva, which shed light on challenges he faced getting around New York as a person with disability. In 2015, mass transit enthusiast Matthew Ahn posted a revised Metropolitan Transit Authority Map on his blog that only showed accessible stops. The map was shockingly sparse; of the 490 train stations in the New York subway system, not even 100 are accessible, he noted. And now? Wikipedia points to a total of 122 stations in New York, as of this writing, that are compliant with the Americans with Disabilities Act (ADA). Yet more troubling is the fact that New York is considered one of the most accessible cities in the country, despite its shortcomings. New York has invested a kajillion dollars in a new subway extension on the Upper East Side. Although weekly and monthly MetroCard fares just went up, whether that money will go toward making ancient stations accessible is dubious. Other fare hikes have come before, yet enabling people with disability to use our city's trains has not been a priority. At least Zach and CPF are raising awareness about what it's like to travel around a city on wheels...or not. I had two reactions to yesterday's news that Sesame Street will soon introduce a muppet with autism named Julia: That is awesome. Followed by: Hey, what about my child with cerebral palsy? Who's representing him? Perhaps parents of children with Down syndrome had the same response. But the more I thought about it and the more I read, the more I realized that a character on Sesame Street with autism is a win for all children with special needs. Julia, four years old, began her career in an online animated storybook (part of the Sesame Street and Autism: See Amazing in All Children initiative) before moving on to muppethood. 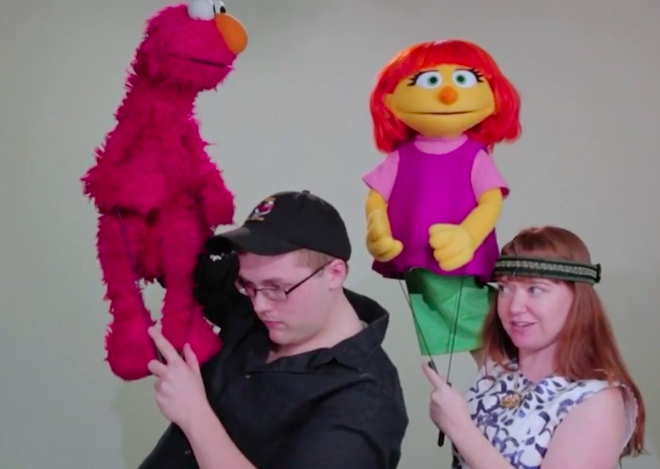 Sesame Workshop consulted with organizations in the autism community to bring her to life. "Meet Julia" will air on Monday, April 10, on PBS KIDS and HBO. 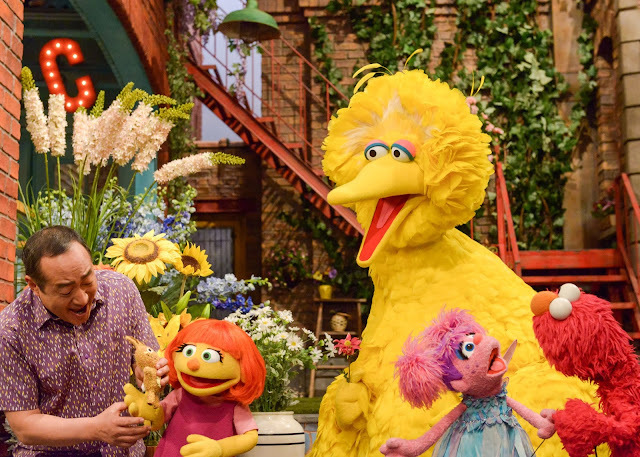 The episode features some common scenarios for children with autism: Big Bird says hello to Julia, but she doesn't respond; Julia gets overwhelmed when she hears sirens and covers her ears. The episode offers simple yet realistic ideas for inclusion, like in this scene where Julia and fellow muppet Abby Cadabby play. After Julia gets so excited that she jumps up and down, the two of them do it together. When a formative program like Sesame Street exposes young children behavior that's common in children with autism, it can help normalize it. Children with disability remain a rarity in TV programs. "It's important for kids without autism to see what autism can look like," Julia's puppeteer, Stacey Gordon, told Sixty Minutes. She speaks from experience—her son has autism. "Had my son's friends been exposed to his behaviors through something that they had seen on TV before they experienced them in the classroom" she continued, "they might not have been frightened. They might not have been worried when he cried. They would have known that he plays in a different way and that's OK."
Yet as just another cute muppet who hangs with the Sesame Street gang, Julia will also enable children to see how their peers with special needs are similar to them. 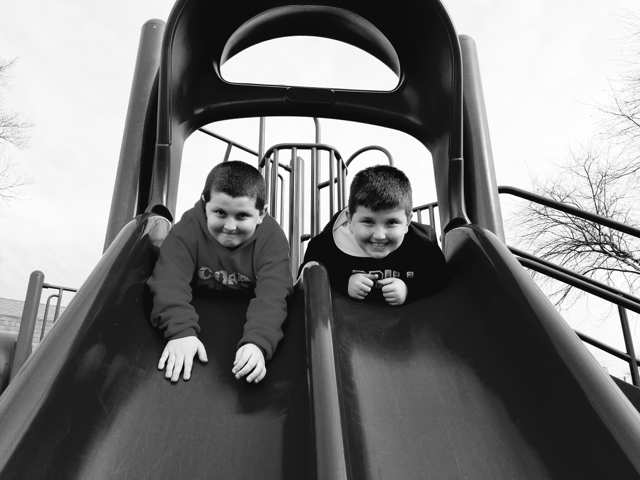 The more little kids get what's more alike than different, the less they'll view kids with special needs as "others." Sesame Street describes Julia as "smiley, curious and loves to play." You know—your typical muppet next door, who just happens to have autism. She likes to sing, too, and she's bright, showing Abby another way besides blowing to produce bubbles. Julia will appear in two episodes in the current season and more in the next, according to NPR. I have high hopes that her presence will help young viewers better understand and embrace autism, along with other special needs. Indeed, some of Julia's challenges aren't limited to children with autism. Max had sensory issues for years, and like Julia was afraid of loud noises. Also like children with autism, children with cerebral palsy and Down syndrome can have unique ways of speaking and communicating. 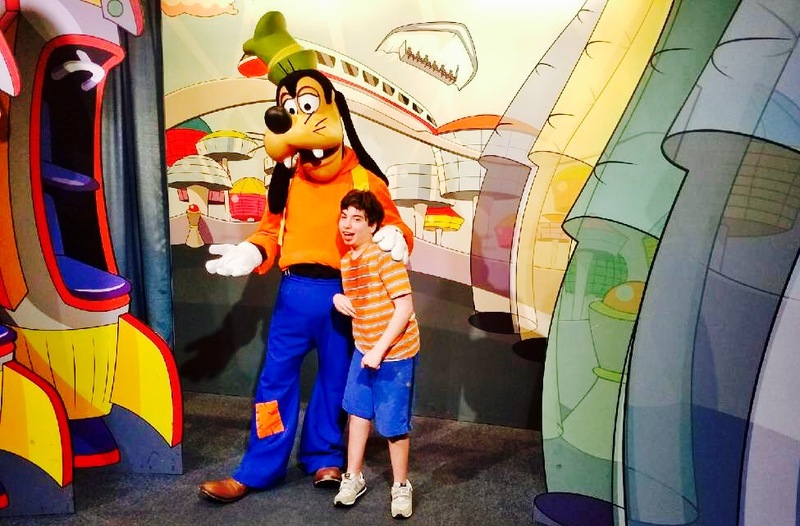 These are things parents can point out to their kids, using the skits Julia's in as springboards for larger discussions about children with special needs. 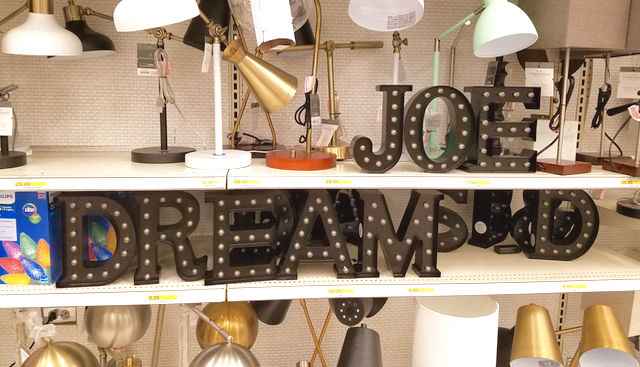 Even if they don't, though, Julia will likely leave a lasting impression. I think of the Street characters I grew up with—curious Big Bird, grouchy Oscar, kooky Ernie and Bert—and how they felt like friends. Perhaps Julia will be one of those characters to the next generation. 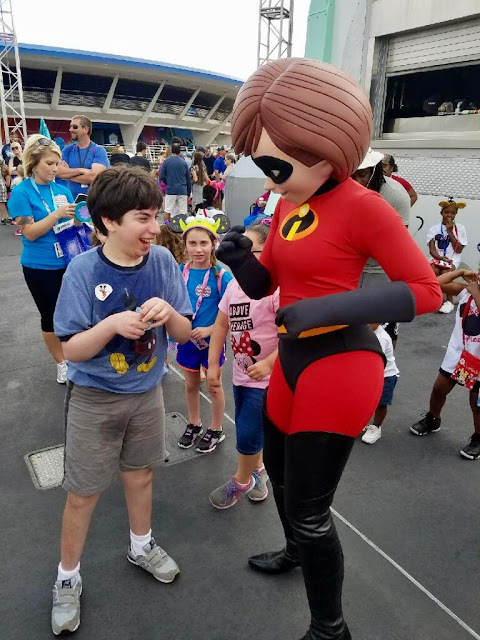 Sesame Street writer Christine Ferraro said it best: "I would love her to be not Julia, the kid on Sesame Street who has autism. I would like her to be just Julia." You can watch all six videos featuring Julia here. Lately, life is so busy that my to-do lists have spawned to-do lists. Writing down all the tasks—and related mini tasks—somehow deludes me into thinking that I'm getting stuff done, even when few things are crossed off. The days fly by and I get so caught up in the business of life and distracted by the stress that I neglect to savor what's important above all, my family. Ben's helping me focus. He's getting so affectionate, and it's incredible to see the new layers of love forming. He's learned to give big, slurpy kisses. He runs into our arms and gives hugs. He's forcing me to stop and savor. I notice when Ben stares adoringly at Dave, Max and Sabrina. I smile when I hear him and Max babbling at each other and when Max says "Benjamin!" oh so clearly. I melt when Ben puts his head on Dave's shoulder and cuddles; he's always done that with me, but only recently with Dave. He has a special bond with Sabrina. When she walks in from school at the end of the day, he has a squeal just for her. She calls him "mush" and her face lights up when she talks about him. Amid the whirlwind of my days, these little moments force me to stop and pause. They ground me. Just for a few minutes, I stop rushing and multi-tasking and worrying and doing and I take in the love and acknowledge: This is all that matters. I handed Ben a straw cup with water the other day. He's been doing fine with a sippy cup but I had one with a little whirly thing that spins when slurped and I thought he'd find it fun. Ben grabbed the cup, put his lips around the straw and chewed on it a bit. Then he started drinking out of it, and flashed me a big grin. I smiled back, happily, but then a pang of sadness struck. Max can't yet drink out of a straw. I can still recall being shocked that he wasn't able to do it—it seemed like such a basic, simple action...unless you have significant oral-motor issues. 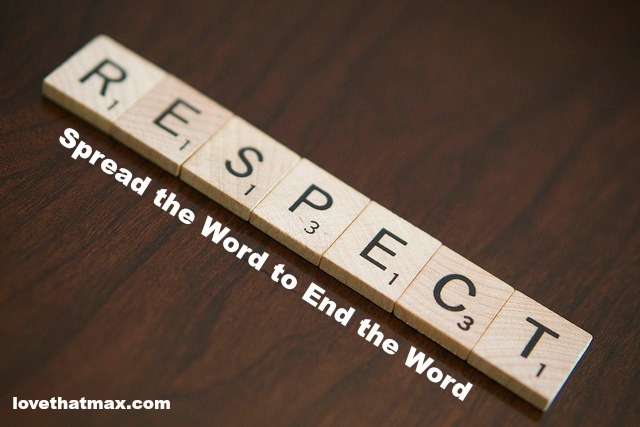 Before Max, I never once considered the coordination required to sip out a straw, drink from a cup, chew food, articulate consonants or just chew candy or gum. 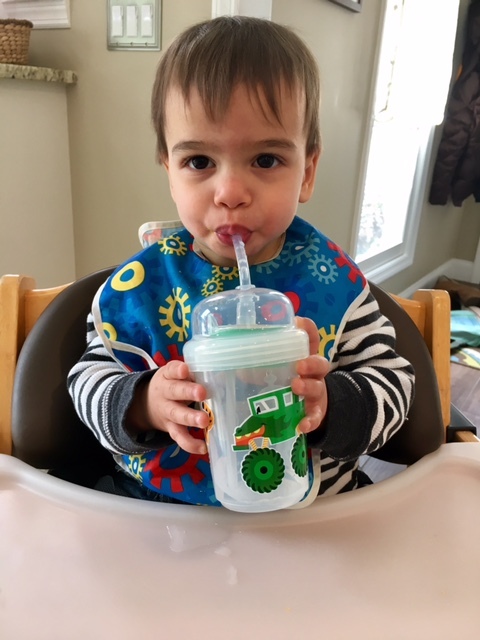 There have been a couple of times when one of Max's speech therapists, with much coaxing and effort, has been able to get him to take a sip or two through a straw. Otherwise, no. While that would come in handy for enabling Max to drink sans spillage, in the scheme of priorities it's not up there. We spend his home speech sessions focused on articulation. Ben's development hadn't previously brought up residual sadness about Max's delays. But when he did something that Max couldn't yet do, it got to me. 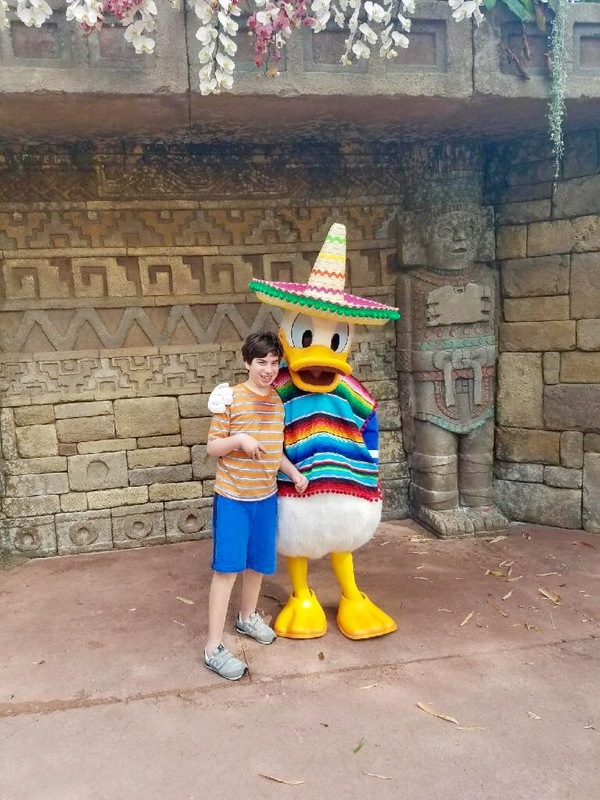 Suddenly, it seemed so unfair that Max has had to expend so much effort—years' worth— to attempt to achieve something other children can pick up in mere minutes. Ben's lips were perfectly closed around the straw; nobody had to show him how. He automatically drew air in and coordinated swallowing; nobody had to demonstrate how. I don't recall feeling this way when Sabrina was little; I think Dave and I were just overwhelmingly grateful that she was developing on time and on her own, sans therapy. These moments of sadness also likely have to do with the fact that there's a major age gap between Max and a baby brother who can drink from a straw and is getting ready to use a spoon. Yesterday, it happened again. Dave made steak for dinner and he sat next to Max, cutting some into small bits and feeding it to him so that it reached his back molars—the texture is particularly hard for Max to manage. Dave had previously been giving Ben yogurt. Ignored, Ben picked up the spoon and started feeding himself, just like that. 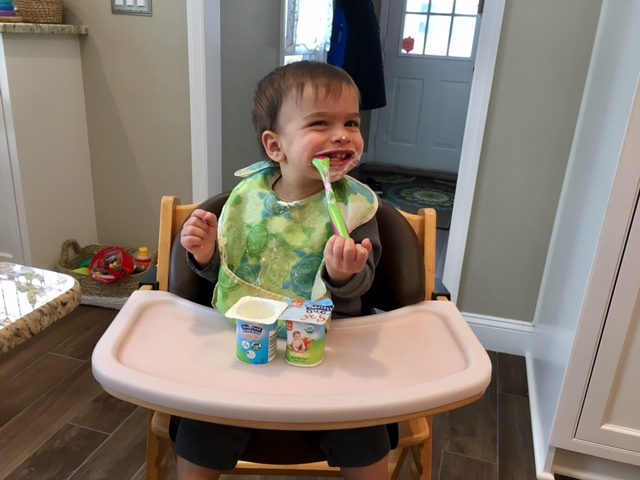 Mostly he got the yogurt on his cheeks and nose, but there he was, figuring out something that took Max a long time to learn how to do. I noticed. Once again, I was savoring Ben's glee and feeling latent grief, too. That passed quickly. Ben looked so pleased with himself. Max contentedly chewed steak. Sabrina remarked "Yum!" as she dug into grilled fish, an actual non-carb. My children were happy. I had no reason not to be. At 15 months old, Ben has two favorite playthings. They are called "a pair of socks." Whenever he can, he opens my sock drawer, makes his selection and toddles around, one clutched in each fist. 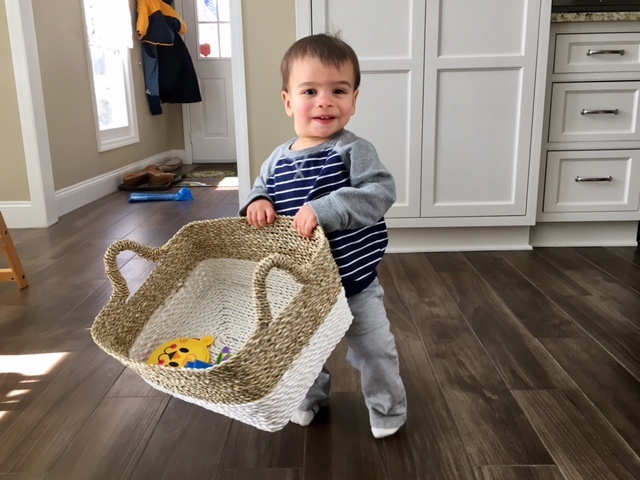 His other preferred toys include the bread drawer (as in, opening and closing it), toting around the basket in our kitchen where I store toys and all the steps on our staircase. I've been trying various ways to get Ben to engage with toys, and in recent weeks I've found great ideas on WeeSchool, a new app a friend asked me to check out for a compensated post. 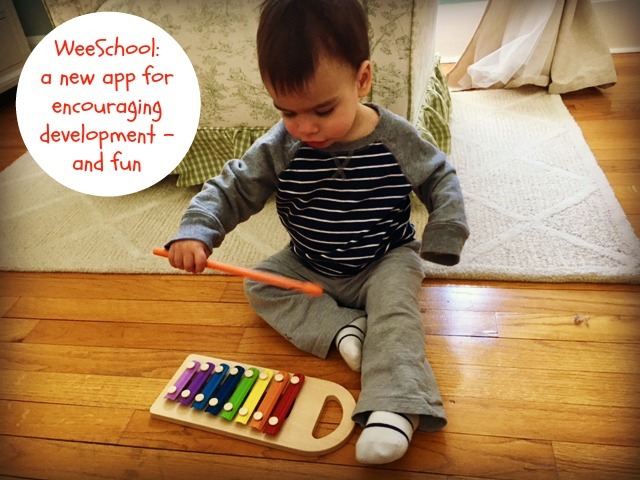 Described as an "all-in-one smart parenting app," it helps parents support tots' preschool readiness. It's also supposed to (B-O-N-U-S!) make parenting easier. The app is the brainchild of the creator of Baby Einstein, Julie Clark. Every activity includes "Why this play is important" info. Participating in music, WeeSchool explains, supports the development of critical thinking, self-assessment, reasoning, problem solving and collaboration skills. Experimenting with sounds, motion and words allows children to communicate in ways that reflect their learning style. The "Music" section under Play offers tunes and accompanying play ideas. 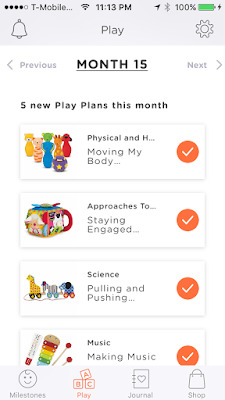 For Month 15, for example, the suggestion is to gather stuffed animals or photos of animals, and discuss the speed at which each moves, like slow for a cat. As you describe their motions, you talk slowly, emphasizing the words "slow" and "slowly." Then you play the mellow tune and imitate the movement of a slow animal. And if you suddenly decide to arch your aching back up and down like a cat because: carrying around a toddler, he will think it's really amusing. While WeeSchool gives parents a personalized way to track milestones—and even lets you snap them as they happen—it also offers ideas for encouraging them. I am not one to zealously stay on top of milestones, but I am all for nurturing them. The video for "Says some words" recommends placing several objects your child knows into a box—like blocks, a ball, a cup, a stuffed animal or a doll—then asking questions about them as she looks in the box. And if she doesn't respond? Well, then, answer yourself. Oh, and in case you could use some ideas for new toys, there are curated suggestions. (Did I mention: WeeSchool is free, just sign up by June 1 to get forever access). 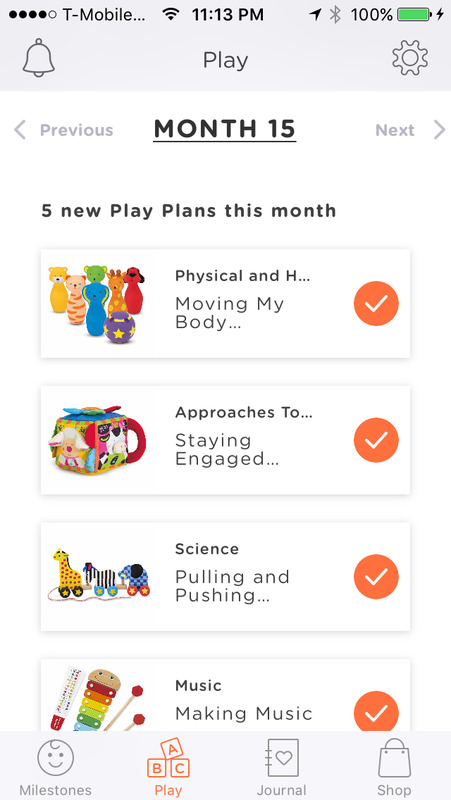 In the Journal part of the app, you can log milestones or just upload monthly See Me Grow photos and videos (and you can opt to get reminders to take them, just in case you're not already taking a bazillion pics of your child). 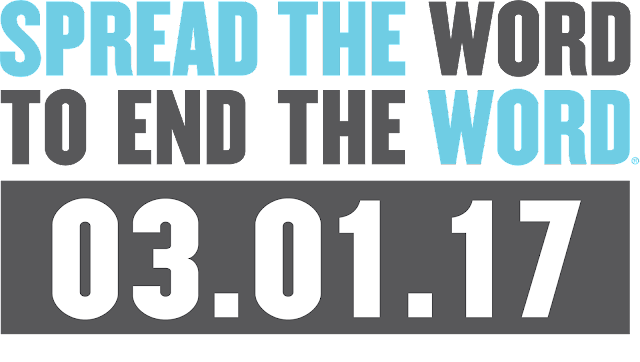 Plus you can share them with friends and family, and export them, too. I really appreciated the tech-y features in the For Baby "Sleep" section. You have nine sound choices, including lullabies, nature or white noise such as Ceiling Fan, Babbling Brook and that wondrous musical delight known as "vacuum cleaner." The selections end after 30 minutes, although you can choose to play them continuously or to restart if your baby cries. If you click "Done Sleeping" when the baby wakes up, the app will save the data so you end up with a comprehensive log of how much your baby's sleeping. The app will not, however, convince your baby that he does not need a 3:37 a.m. feeding, which is where your partner will come in handy. Getting a tot to sleep well isn't easy. Neither is entertaining one, especially when you're competing with wondrous socks. But WeeSchool has been helping me to better capture Ben's attention and nurture that growing brain of his—and make floor time more exciting for both of us. Attempt to become BFFs with the office receptionist in the hopes of snagging an appointment with the specialist who can't see your child till 3017. Start feeling guilty that you're not going to do all of the exercises the therapists recommends the second she tells you them. Hoard stuff from restaurants and stores. Those short, stubby pencils at IKEA: perfect for grasping! Burger King straws: so wide and slurp-able and in very attractive red! At night, sit on couch or at kitchen table and stare vacantly into space for fun. Surreptitiously sneak glances at other babies and children in the mall or park to see how they are acting and behaving, how their hands and limbs are moving and other stuff you shouldn't be comparing but do. Raid the bag of Cheez Doodles—you know, the ones your child uses for feeding therapy. Use a variety of exaggerated facial expressions and gestures around your child: frantically shaking head = stop kicking the back of that person's seat; frantically wagging hand in front of mouth = please quit asking that guy where his hair is; frantically wiggling eyebrows = DON'T EVEN THINK ABOUT IT. Get perturbed with the insurance company staffer on the phone who asks for your ID even though you just punched it into your keypad. Because: You are going to get ticked off at her anyway, might as well start. Get every bit as giddy as your child gets when you spot another train/manhole cover/car wash/digital watch/fire extinguisher/[insert object of obsession]. Gird yourself for IEP meetings as if you are going into combat. Act like absolutely nothing is happening even as your child is having the meltdown to end all meltdowns in a public place. Sense that someone is about to shoot your child a dirty look and head them off with the evil eye. Sit in the car on some random street, your child asleep in the back seat, and have a good cry. Go to the drugstore to pick up meds and roam the aisles for a half hour. Just for fun. If you're the parent of a child with autism or intellectual disability, you have likely pondered (and pondered) what it means to have brain differences. 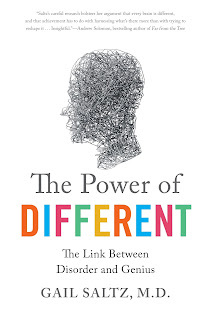 Psychiatrist Gail Saltz, M.D., has written a a book about that: The Power of Different. In it, she examines so-called brain "problems" including learning disabilities, autism, ADD, depression, anxiety and bipolar disorder and demonstrates how they can be directly associated with the potential for great talent. In fact, the glorious diversity of the human mind makes the world a better place, she posits, and we'd do well to work with what's there rather than reshaping it. 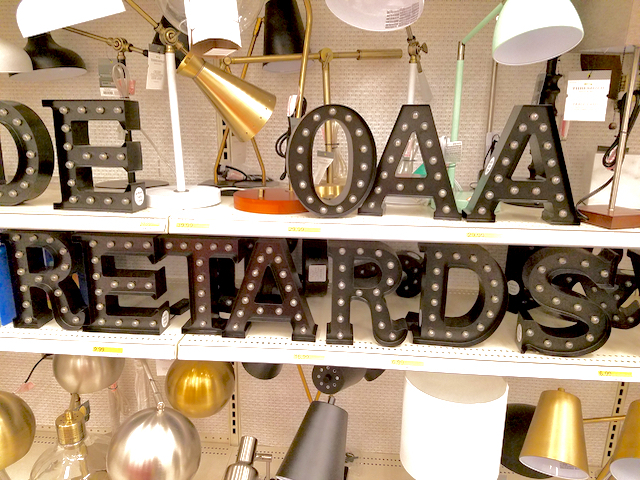 Disorder? No! Vive la différence? Yes!! Here, Dr. Saltz weighs in on explaining brain differences. 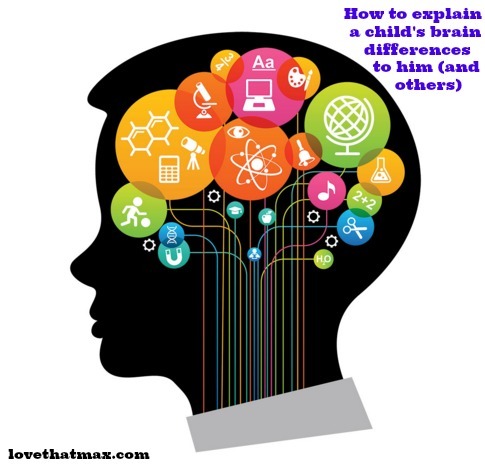 How do you explain your child's brain differences to him? Even a child aged 5 to 10 can tell that they are perhaps struggling with something that other children their age are not. So explain to your child that everyone has things they struggle with, and things that they are better at. "We all have different kinds of minds," you can say. "Some minds are great at reading, some are great music, art, making new friends and understanding how other people feel. There are so many different areas that one might find more difficult and others that they might excel in. "Every person's job, and the job of their parents, is to understand their own brain and to identify and help them with areas which are a struggle while at the same time try lots of different stuff to figure out what they are good at—and perhaps even like—so they can develop those things. So, for example, you may say we know that your brain difference means reading is really difficult for you, and we get you extra help to keep that from preventing you from doing things you want to do like like participate in school. But we also see that you are very good at puzzles/organizing/building Legos and that is a strength we want to help you develop and enjoy." 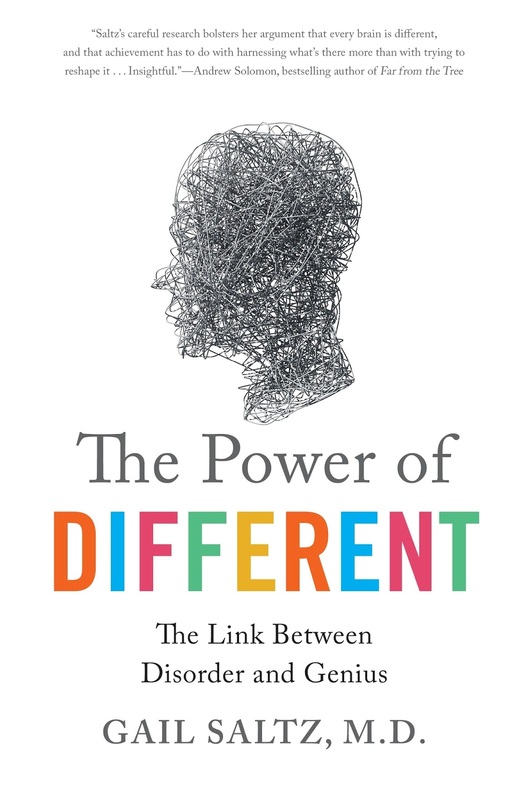 For older children, in addition to the same message, its helpful to point out that as many as half of all people will struggle with a difference at some point or another, meaning different isn’t entirely different. Teens are particularly focused on their identity and fitting in with their peers, so it's an especially difficult time to be feeling different. So in addition to discussing how everyone has strengths and weaknesses and identifying theirs, you might make extra efforts towards opportunities to find peers who struggle with similar issues. Again, though, even within this kind of peer group they will still be able to see there is variation in peoples strengths and weaknesses. What do you say to a child's siblings about his brain differences? It is just as important for siblings to understand that due to brain differences which are wired in, their sister or brother may be unable to do some things, but really be able to do others. 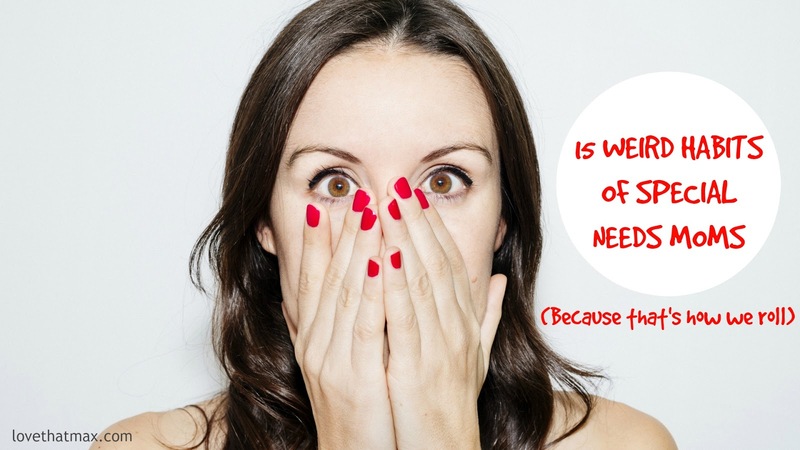 Siblings tend to struggle with guilt (Why did it happen to them but not to me?) and concern that their sib gets all the attention because they need it. Explaining that each of them have weaknesses you will tend to that are nobody’s fault, due to brain differences, and strengths that you hope to encourage is a good start. You can guide a sib in terms of ways that they can connect with their brother or sister via the strengths you can identify. Explain to your child that the brain is an organ and like any organ, when something that changes functioning happens, it can limit doing things they may take for granted such as making friends easily, playing a sport, managing a lot of commotion or explaining their feelings. Yet unlike other organs the brain is plastic and it can keep changing, which is why you get help for their brother or sister so they can learn new things. Give them these words so that when friends ask them what’s going on, they have a way to explain that is comfortable and doesn’t put down their sibling. For example: "Julia has a difference with his brain that makes talking to you really hard, but he is great at counting." What do you say to relatives, who may not get it? Sometimes relatives don’t get it because they don’t want to get it; they are avoiding what they perceive as upsetting. When you speak about a condition, it's most helpful to be clear about what it is with specific descriptions that relate to interactions your relatives have with your child. For example: "Alex has autism so making eye contact is difficult. He likes playing piano, though, and would enjoy showing you his music." Explain to relatives that this is not a matter of willfulness and willingness; this is about a brain difference, and that it's most helpful if family can be flexible about accommodations you might need at gatherings on your child's behalf. And what do you say to teachers? School systems are mostly designed the child with no issues, which is why you need to be your child’s advocate with individual teachers regarding both difficulties along with potential strengths. 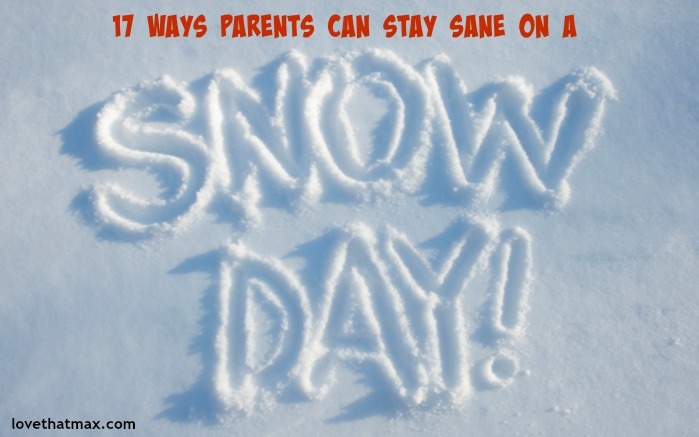 You'll want to share coping strategies you employ to manage weaknesses, and ask for their help in finding new ways to do that specific to school tasks. But perhaps more importantly, ask your teacher to help identify strengths and provide space and tasks at school that play to those strengths. Request ways to do projects that employ your child's strengths. For example, can they show a math concept by building a block model? Can they create a musical presentation that captures the way a book made them feel? 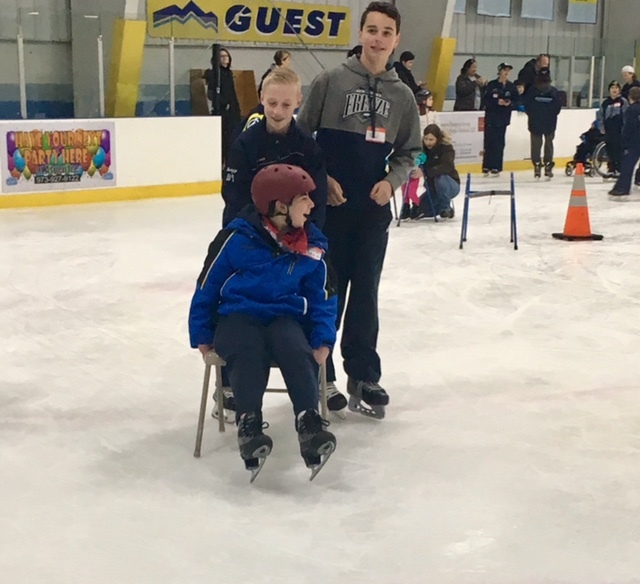 You're simply helping the educator see that while your child has a brain difference that makes certain things difficult, there are areas of relative strength that you hope as a team to develop and encourage. You're helping her see that a brain difference in one arena does not affect every arena. There are different types of intelligence and aptitude, and each child deserves to find theirs. "Max wants to go to the supermarket with me," said his speech therapist. Jeri has been coming to work with Max on Saturday mornings for well over a decade now. She's smart, she knows her stuff and she really cares about Max. 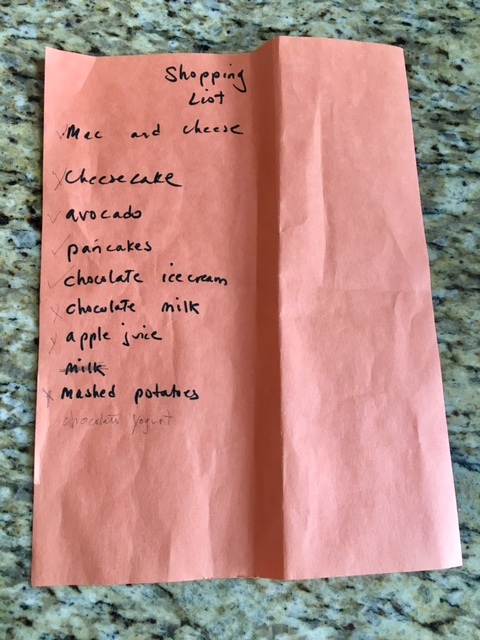 Turns out they had put together a shopping list or, rather, a lis tof Max's food fantasies: mac 'n cheese, cheesecake, avocado, pancakes, chocolate ice-cream, chocolate milk, apple juice, milk and mashed potatoes, a balanced diet if ever there was one. When Max suggested they actually go to the supermarket, Jeri agreed. 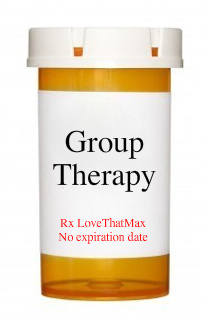 Therapy is second nature to Max. He has been in one form or another since he was a month old. "Get him as much therapy as possible" a renowned pediatric neurologist told us, and we went all out. 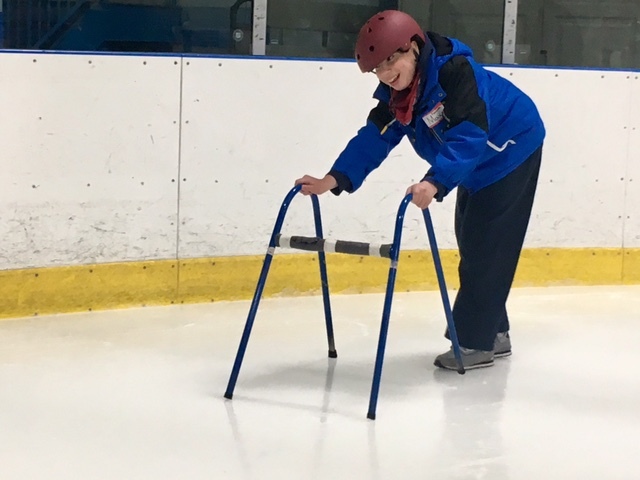 We started with physical therapy, then came occupational therapy when he was about six months old and speech therapy a bit later. We also did aquatic therapy (basically, PT in a pool), hippotherapy (horseback riding), craniosacral therapy and hyperbaric oxgyen therapy. If it couldn't hurt and it might help, we've done it. 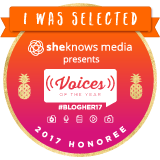 Often, we were able to get the insurance company to reimburse us thanks to staffers who knew the right codes to use and my big mouth. Although Max doesn't think twice about therapy, he still needs to be actively roped into it. An OT he had for years ran out of ideas and, I found out, spent therapy sessions letting him bike up and down our block. Yes, riding a bike is good exercise but I didn't need to pay someone for that. The OT who followed was so creative. Each session, she'd arrive with a different craft, game or activity—a fire truck to make out of buttons, a shadowbox project, a game that involved manipulating different letter tiles to form words. Parents of children with disabilities know that everyday life offers plenty of therapeutic opportunities. 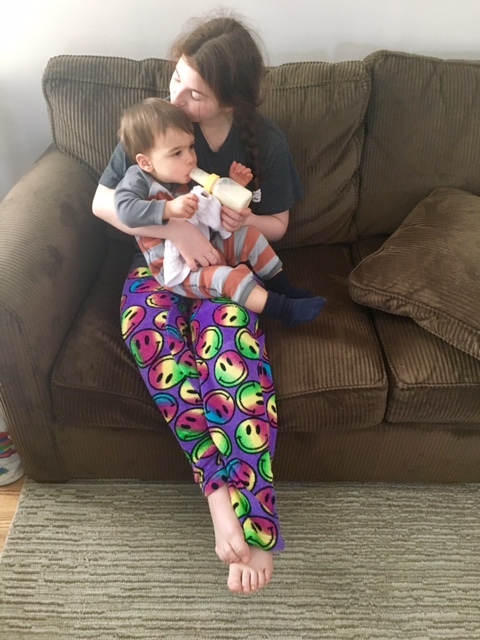 I bicycled Max's little chubby legs on his changing table, helped him learn to hold a ball with two open hands when we played and encouraged him to reach up to brush his hair, holding his elbow for support. Max needed to learn how to go through all the motions. At times, though, this could be overwhelming. I felt a lot of pressure in Max's early years to always work with him, getting his muscles to do better. Play was never just play—it was therapy. Going to a park was never just going to a park—it was therapy. 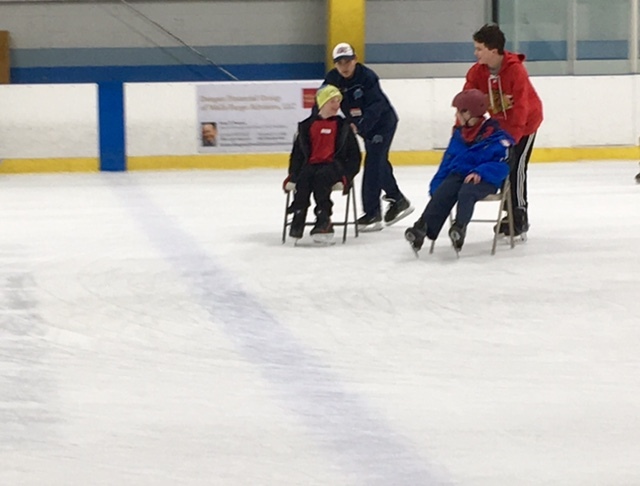 Attending a birthday party at a gym was never just going to a birthday party—it was therapy, and torture to boot as all the other tots Max's age scooted around and Dave and me as we'd encourage Max to place a foot on a step and then another. The pressure eased up as the years went on. 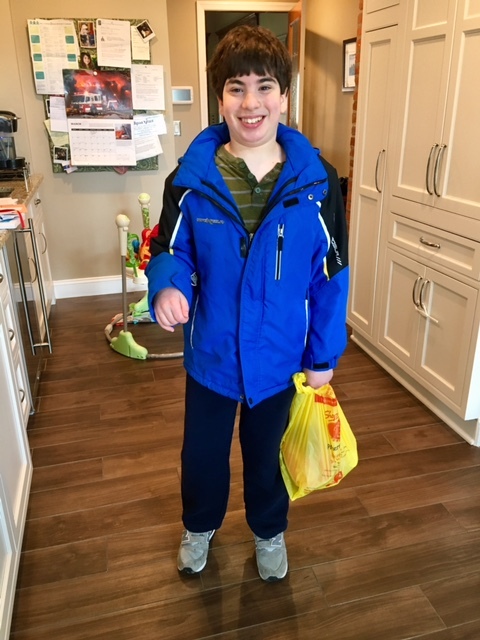 It was part progress—Max would learn to walk, speak words, feed himself, walk up the stairs on his own and dress himself with adaptive clothing—and part acceptance. Max would do what he could do. We guide him as best we can, but we no longer feel like the worst parents in the world when Max is just lounging on the couch and watching TV (although there are certainly leg exercises to do if we want). We owe the therapists a huge debt of gratitude—all of the school ones who have worked with him over the years, and the private ones who have come to our home. 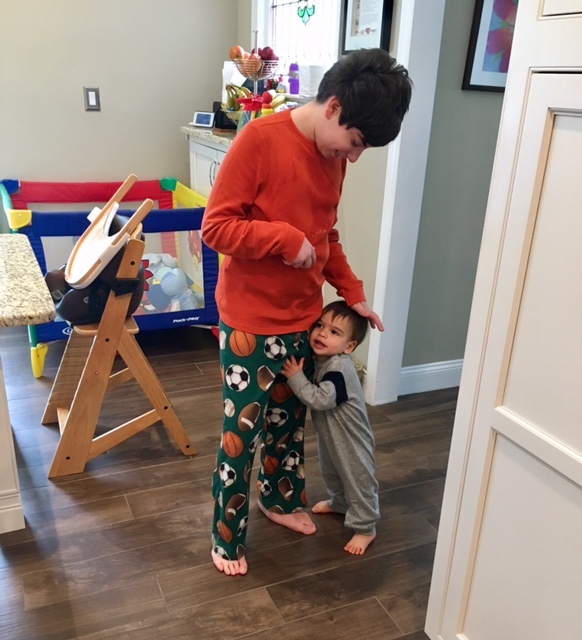 Mindy, who first taught Max how to crawl, guiding one limb forward at a time as she crouched over him on the floor and who eventually enabled Max to walk. Nafeesa, who taught him to hold blocks and pegs. Margie, who always entertained him and made progress with pulling pants up and down. Cristy, who's trying a form of movement therapy with Max that Dave and I are going to be learning in a few weeks. And Jeri, the speech therapist who has been with him since he was little. Supermarket therapy was especially genius, because Max loves both foods and trips and we'd be ever so thrilled if he said the "p" in pancakes and mashed potatoes. And so, off they went on Saturday morning. Max came back with his stash of foods and a gigantic smile on his face. No "p" this time but maybe the next.